Scala is an emerging programming language just like C or Java which is designed to use with common programming patterns. According to the website of Scala, it is a language in a concise, elegant and type safe way to express common programming patterns designed for general purpose programming language. It effortlessly integrates top features of object-oriented in addition to functional languages, enabling Java as well as other programmers to become more effective. Code size is usually reduced by two to three times when poised with a similar Java application. Many active companies that count on Java as vital application for business are turning to Scala to further improve their development productivity for applications’ scalability in addition to overall consistency. Scala was designed to interact effectively with mainstream programming platforms including Java or perhaps C#. It shares with these languages most of the fundamental operators, data types, as well as control structures. Scala source code will probably be compiled in order to Java byte value, so the resulting executable program runs with a Java exclusive machine. Java libraries work extremely well directly inside Scala value and vice versa (language interoperability). Like Java, Scala is usually object-oriented and works on the curly-brace syntax similar to the C programming. Scala Programming certification program from Brainmeasures is a unique program that'll enable you to become much more proficient along with skilful in Scala IDE and programming environment. This qualification program will definitely increase your experience and efficiency when it comes to understanding about object oriented and functional programming in concise and elegant manner. 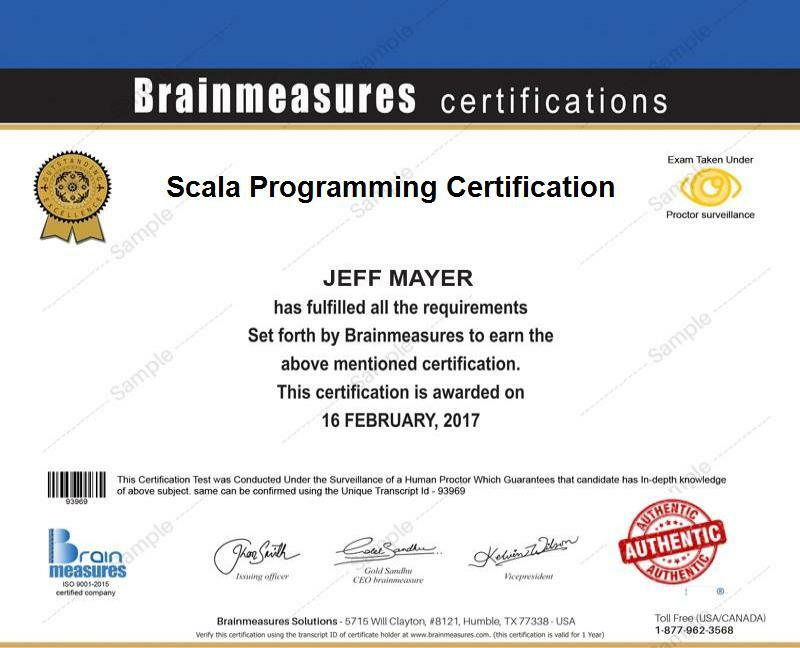 After going through the distinct topics involving Scala Programming qualifications of Brainmeasures, it is possible to face different approaches of programming applications. This just all requires to join Branimeasures Scala Programming course and that is enriched with practical scenarios and different code writing approaches in the program. This is not just an additional expertise within your Resume but also an added skill which will lead to increase in your salary and chances to have promotion within your career route. Entitlement regarding Scala Programming expert, analyser, engineer, developer, designer as well as implementer etc. through this certification program of Brainmeasures not just develops expertise but also increase your income and wealth generation sources. The average annual salary in case you hold Scala Programming certification with other professional degrees is $80,000 per year and this can be grown to $100,000- $145,000 based on level of apropos expertise, experience along with reputation of the employee and organization in the relevant area. Scala Programming certification of Brainmeasures requires some technical knowledge, expertise in object oriented and functional programming languages. However, enrolment is not just confined to experts. All learners and programmers can join who are eager to enhance their competencies in the smart programming and increase their expertise in computer science. This certification program appeals to everyone whether a technical and IT specialist, software programmer, software developer, software engineer, software auditor, QA and QC engineers as well as students, individuals and corporate players who wish to understand about smart programming writing and applications.